I have been fairly vocal about designers and publishers repeatedly using similar themes. Dragons, goblins, wizards, merchants, medieval cities … haven’t we had enough of those tired themes? Well, I certainly cannot level that same complaint against Xavier Georges’ Ginkgopolis. Indeed, it probably goes to the other extreme, using a new age, futuristic theme that borders on the wacky. Set two-hundred years in the future, earth has severely depleted its resources, so it is imperative that cities be built in a fashion that maintains the delicate balance between resource production and consumption. Building space is at a premium and it is more economical to construct up as opposed to spreading out. Players each have a team of experts to help in this task, providing resources and materials needed for building. So what in the world does the Ginko Biloba tree have to do with this? Nothing, really. The story is that the ancient tree is now the symbol of this new type of construction. Perhpas the Ginkgo’s characteristic resilience to pollution and difficult circumstances contributed to the designer’s decision to use it as part of the theme. Still, the tree that gives the game its name is completely absent from the proceedings. Fortunately, strange theme aside, Ginkgopolis is a very good game. There is no board per se. 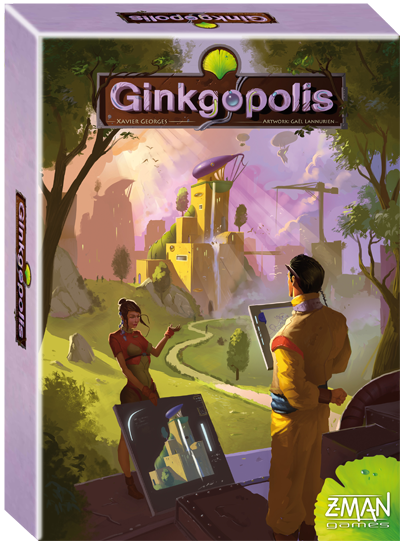 Rather, the playing area – the city of Ginkgopolis – is formed by the playing of tiles, each representing a futuristic building. Each building tile depicts a color (blue, yellow or red) and numerical value ranging from 1 – 20. The city initially consists of nine tiles: buildings 1, 2 and three in all three colors. 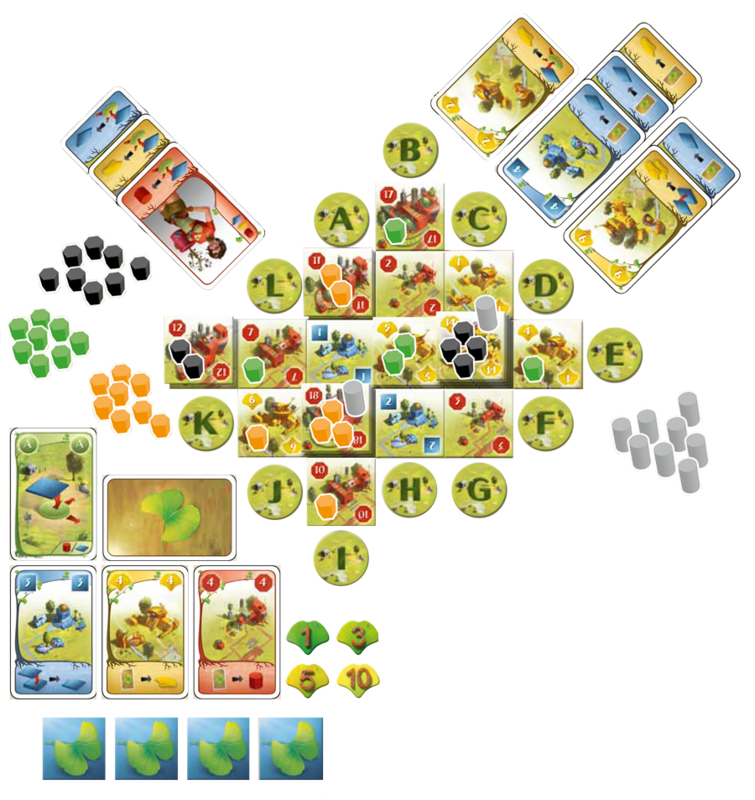 Players each receive three character cards, representing their building experts, which also grant the player an initial supply of items, including building tiles, victory points (“success” points) and resources. In the introductory game these cards are distributed, while in the normal game they are drafted. Players keep their tiles, resources and success points behind their privacy screen, taking additional supplies when granted from the general supply. The initial deck of cards consists of twelve urbanization cards and nine building cards, the latter matching the nine starting building tiles. New building cards will enter the deck as tiles are added to the city. The initial deck is shuffled and four cards are dealt to each player. 1) Choose a Card. Players each choose a card and place it face-down. They may play the card alone, or play a building tile upon it. There are two types of cards: urbanization and building. The twelve urbanization cards correspond to the twelve letter tokens that surround the city. These cards are used to gain resources or tiles, or, if played with a tile, to expand the city. The building cards allow the player to activate an existing building in the city, gaining the items it produces, or construct a building tile on top of an existing building. 2) Resolve Actions. In turn order, players reveal their cards (and tiles) and resolve them. This is the most confusing aspect of the game and requires constant explanation throughout the course of the game. The confusion stems from the numerous card / tile combinations and the various rules surrounding these. A brief explanation of the combinations is in order. Urbanization card only. The player may take a building tile or resource from the supply. It is important to maintain a steady supply of tiles and resources, so this is often a desirable action. Building card only. The player utilizes the building whose number matches the card played. The player gains an item(s) that the building provides: tile, success point or resource. Multiple items are earned if the building is at a higher level. For example, a building located on a third level will produce three items. Urbanization card with tile. The tile is placed in the location of the token that matches the letter on the landscape card. The player places one of his resources on the newly placed tile, indicating ownership. As an additional reward, the player may utilize the buildings that are orthogonally adjacent to the newly placed tile. Utilizing a tile means the player receives the items that those tiles produce: resources, tiles or success points. The higher the building level, the more rewards received. Building card with tile. Since land in the future is limited, cities must build up. This is the action that does just that. The tile played is placed atop the tile bearing the same number as the played building card. Any resources on the current tile are returned to their owner and the active player must place a number of resources on the new tile equal to its height. So, a tile placed at a third level requires the placement of three resources. There is more to consider. If the color of the newly placed tile is different than the tile being covered, the player must pay one resource. If the number on the newly placed tile is less than the number on the tile being covered, the player must surrender success points equal to the difference. That can be quite significant, so players should be very wary of covering high-valued tiles with low-valued ones. Plus, high-valued tiles are best conserved to later in the game when many tiles in the city are likely to have higher values. When a player executes this action, he keeps the building card in front of him, adding it to his array of character cards. On future turns these building cards will provide additional items (tile, resource and/or success points) whenever the depicted action is taken. The more building cards a player accumulates, the more items he will receive whenever he takes the corresponding actions. Collecting numerous cards that grant extra items and end-of-game success points is an important aspect of the game. Whenever a new building tile is added to the city, its matching building card is placed in the discard stack of cards. These additional cards will go into circulation when the discard stack is re-shuffled. After a turn, players pass their remaining three cards to left, and a new card is dealt to each player. This card transfer is an interesting part of the game, as players are forced to choose only one card from the four in their hand. However, it does reduce the amount of planning players can do, as they do not know the type of cards that will be passed to them. This can be frustrating, and some may find this process too random. Slightly mitigating being passed an undesirable set of cards is the ability to discard them and draw a new set of cards by discarding one of the two “new hand” tokens each player possesses. Conserving these tokens, however, grants the player two points apiece at game’s end. In addition to earning success points during the course of the game, players are angling to gain control of various districts within the city. A district consists of two or more adjacent buildings of the same color. The player with the most resources in that district controls it and scores points equal to the total number of resources of all players present in that district. The player in second position scores points equal to the number of resources he personally has in that district. Each district is scored in this manner. The amount of points that can be earned from controlling districts can be huge, so players should maneuver to grab control of as many districts as possible, particularly the larger ones. The best way to do this is via the placement of building tiles atop other tiles. This is also a clever way to split districts. This aspect of the game can be quite exciting and tense, especially as the game nears completion. The game ends when either the stack of building tiles is depleted the second time or when one player has placed all of his resources in the city. The first method is quite interesting, as when the supply of building tiles is depleted the first time, each player may contribute more tiles from behind their screen, earning one victory point per tile contributed. Thus, if a player feels he needs the game to continue in order to achieve his goals, he can contribute tiles. If a player feels he is winning, he may opt to not contribute tiles. Usually there are only a few tiles contributed, so the game ends in just another turn or two. Once the game ends, players tally the success points they earned during the course of the game, points earned from end-game building cards, and points earned from the districts. Of course, the player with the most success points rises to prominence within Ginkgopolis and wins the game. One of the greatest strengths of Ginkgopolis is that it is different. Yes, it has elements of tile and worker placement, card management and area control, familiar mechanisms that we have all seen used many, many times. However, the manner in which they are assembled gives the game a fresh and unique feel. It doesn’t really feel like any other game. There are a myriad of challenges facing players. Players must maintain a steady supply of resources and tiles flowing into their reserve, as these are required to place new tiles and expand one’s influence in the districts. It is easy to succumb to the temptation to continuously place new tiles, as this can earn success points and increase one’s presence in the districts. However, this can quickly deplete one’s supply of tiles and resources, so often players must play an urbanization or building card solely for the items it will produce. Players should also carefully manage their building tiles. As the game progresses, grabbing control of districts – or splitting those controlled by your opponents – becomes increasingly important. Players should carefully manage the tiles in their possession, as high-valued tiles become very important in accomplishing these tasks. It is also important to keep a mixture of the various tile colors, as this gives players flexibility and more options. The competition for control of the districts becomes more pronounced and keen as the game enters its final stages. A deftly placed tile can suddenly split a large district, denying large amount of success points to an opponent, or swaying control to another. It is difficult to defend against such an incursion, which may be problematic to some. The best method is to gain large majorities so that wresting control away is difficult. Of course, this is not an easy feat to accomplish. While I thoroughly enjoy the game, there are issues. It is difficult to remember the various card / tile combinations and the benefits they convey. In spite of having played the game numerous times, I still have to consult the rules regularly during the course of the game, either for my own benefit or to explain these combinations to my fellow players. The card passing mechanism does inhibit much advance planning, making the game more one of tactics as opposed to long-term strategy. Finally, the theme is, in 70’s vernacular, “far out” and wacky. It sort of has a hippy, new-age feel. In reality, it is very thinly attached. The game could have just as easily had a standard city building theme, but I guess the designer and/or publisher felt we already have enough of those. In spite of these issues, Ginkgoplis is a very good game, one of the best released in 2012. Due to the confusing card / tile combinations, it is probably best suited for gaming aficionados as opposed to families. In that circle, however, the game shines. Ginkgopolis is yet another hit for designer Xavier Georges.